Utilizing the Engineered solutions approach, a Humphrey engineer worked directly with the customer’s engineering department. 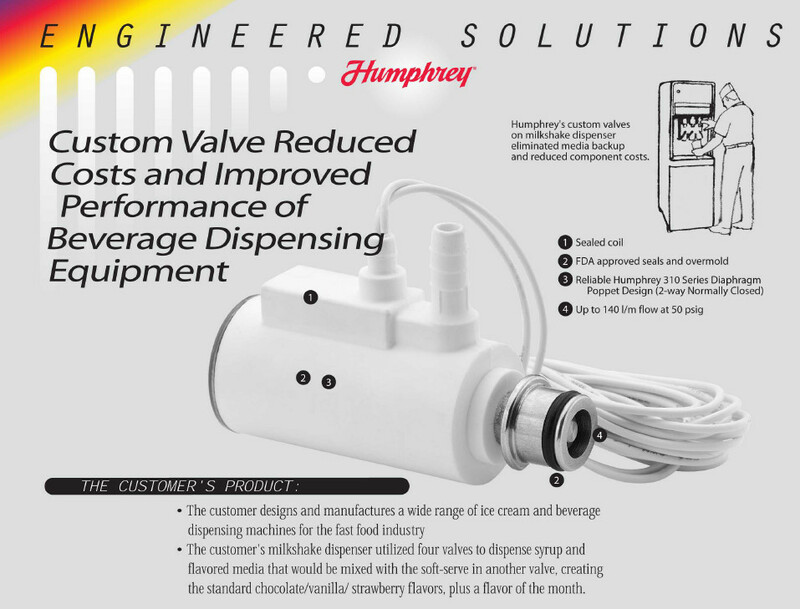 The team identified an opportunity to reduce costs and improve the milkshake flavor dispensing system by utilizing a reliable Humphrey 310 Series Diaphragm Poppet design for each of the four syrup valves, eliminating the final mixing valve. The new valve design has a 0.125 inch orifice and a flow rate of up to 140 1/m at 5 psig. This would ensure reliable functioning when operating at the customer specified 0-15 psig pressure. The valve utilized approved seals and over mold materials, and a totally sealed coil to meet requirements for daily cleaning. The air piloted version provided sufficient force to handle syrups with suspended solids without clogging.